In disentangling the, often conflated, evaluative and educative functions of preservice teacher supervision, the authors reimagine supervisory practice within the specific context of the post-observation conference. Claiming the post-observation conference as a teaching space provided the impetus leading to the design of a theoretically grounded post-observation conference protocol foregrounding the educative function of supervision, leveraging the mediating role of the university supervisor in supporting preservice teacher learning, and reflecting the principles of effective feedback. A critical feature of the protocol is the intentional focusing of feedback on one of four superordinate elements of teaching that provides continuity and consistency across post-observation conferences allowing preservice teachers to connect knowledge and skill related to the development of complex practice. It is well understood that one cannot perfect a practice-oriented activity solely from reading about it in a book. However, it does not follow that book learning has no place when one is initially learning, continuously refining, and over the course of a career, perfecting a practice-oriented activity such as teaching. The long-standing schism between learning to teach in the context of the college classroom versus learning to teach in the context of field experiences serves to establish a dichotomy familiar to teacher educators across the globe: the theory-practice divide. Too often, preparation programs design curricula as though theory and practice are opposite ends of the same continuum with the goal of striking what they perceive to be the right balance between the two. This approach seems to simplify the process of learning to teach and the role of teacher education and teacher educators, by framing it as a linear space where the inferred challenge is to bring the dichotomy between theory and practice into balance. In contrast, the authors envision learning to teach, and the relationship between theory and practice, not in this linear fashion but within an orthogonal space where theory and practice are independent entities each with their own unique and independent learning trajectories. Others have referred to this orthogonal space as hybrid or third spaces, where dichotomous thinking is reimagined bringing knowledge and skill together in new ways serving to create new teaching and learning opportunities for the teacher educators and preservice teachers in that space (Bhabba, 1990; Gutiérrez, 2008; Zeichner, 2010). One can imagine that within this orthogonal, or third space there are times when the preservice teacher (PST) might first be introduced to a pedagogical practice along with opportunities to enact the practice (the how) and then is introduced to and learns the theoretical and research base that informs the practice (the why) or vice versa. Regardless of the sequence, the authors, like others, contend it is the iterative back and forth between theory, research, and practice that makes what teachers do both visible to and learnable for the novice (Ball & Forzani, 2009, 2010: Grossman, Compton, Shahan, Ronfeldt, Igra, & Shiang, 2007; Kazemi, Lampert, & Franke, 2009). It is within this iterative space that the PST most needs the assistance of a more experienced teacher. 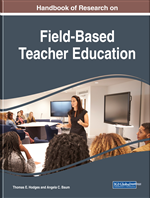 This third space, therefore deserves greater attention by teacher educators as they consider, develop, and enact particular teacher educational pedagogies that are well suited to supporting PST learning.